Here is a many-in-one post about various gadgets we own from Kessler Singapore (www.kessler.com.sg). TC and I watched this amazing mop on some late night sell-a-vision programme on night a few weeks ago. But we balked at the almost 80 dollar price tag. Seemed like a real cool thing for a gadget-crazy family to own though. 😀 It was supposedly selling at Giant, some department stores, etc, and we said we should go take a look. Which we never got around to of course. Then two weeks ago, while visiting our favourite haunt, Downtown East (it is 600 metres from our home), lo and behold, Kessler was there doing a demo of the Wiz Mop! We don’t know if it is the same brand we saw on TV, but it looks and works just like it. the spinning wringer gets so much of the water out, so you are working with a slightly damp, not wet mop! Great if you have little kids stepping around all the time and you need the floor to dry quickly. And best of all, it was selling at a promotional price of S$59.90! And with TWO, not one mop-head! (Now *I* sound like some promoter!) So of course we had to get it. *grin* And our kids have been fighting over who gets to mop what! Ha ha. You must of course be wondering why we need a mop when we have the Roomba AND Scooba iRobots. 🙂 Well, I use it to dry the balcony after it rains, as well as to mop bathrooms, our sunken bathtub, balcony, wash area, and the toilet in the wash area which is sadly neglected. 😀 Also since buying it, I have taken it out to do a quick once over of the kitchen after frying food so that I won’t be tracking oil through the house before the Scooba does its job at night. 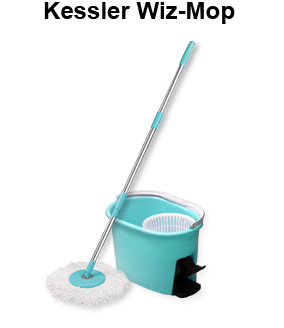 I would never have thought of mopping as a “quick job” before, but the Wiz Mop has made it really easy. We have owned the Handy Brew for almost 2 years now and use it almost daily to brew TC’s Chinese tea. 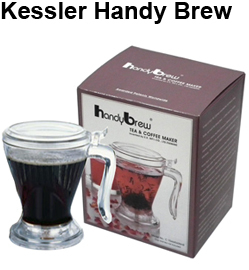 🙂 If you are a coffee or tea drinker, and if you use a coffee-maker to brew your favourite drink, then you are going to have to run out and get the Kessler Handy Brew. 😀 It is so good, we have TWO! It is way better than the Bodum style coffee maker because unlike those, where you have to push the plunger down before you pour, then can’t add water to re-brew, the Handy Brew allows you to keep adding water, like you would with Chinese tea. Also, to dispense the drink, just put the pot over a cup and it pours out from the bottom! How cool is that huh? We have given away many of these as gifts! Oh, and we make local coffee, teh tarik and chrysanthenum tea in it also! Love your recommendations..now I am so tempted to go out and get the mop..
Where did you get the handy brew? I have yet to find a easy way to brew my lovely coffee and keen to explore more! Hey there Minna. I got mine from a roving sales person who was doing a demo in the Pasir Ris Drive 6 wet market. 🙂 You can try to contact them through the info provided on the website: http://www.kessler.com.sg/contactus.html. You should certainly try it! We use it for ground coffee, both “ang moh” and local. Ah! Have been eyeing the mop for a while but wondering about the HAIR issue. Lol! So what do you do with the hair that is mopped up? Pluck it out – ewwww GROSS!!! Share, please! Just for you, my dear Serene, I am forgoing a few minutes of sleep to check on the mop and respond to your EWWWW question. I really like that handy brew. Saw it at Max Brenner’s. How much did u get it for? Thanks.